Telcred’s cloud-based access control system with door controllers from Axis Communications and wireless locks from SimonsVoss and Assa Aperio now offers full API-support for third-party mobile apps and credential readers, such as cameras and fingerprint readers. With the new functionality it becomes super simple for any app provider to offer access control functionality in their product. 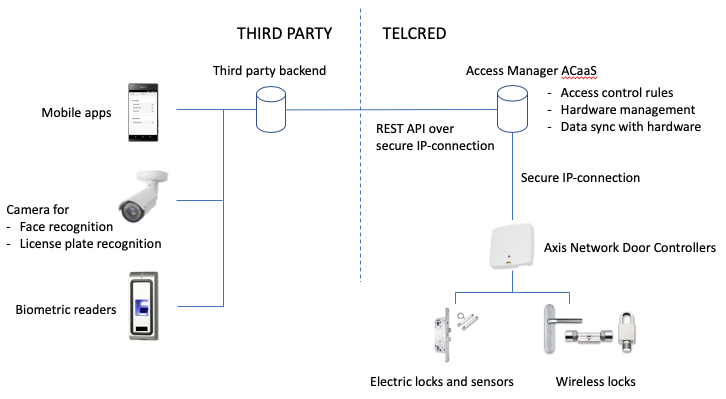 All the management of the access control hardware and access control rules can be done in the Telcred system. When the app user wants to open a door, the app backend only needs to send a simple API request with the user and door identities. Telcred’s backend will then evaluate the request against the defined access control rules and remote open the door if the user is allowed to do so at this point in time. The exact same model can be applied for any third party credential readers, e.g. video cameras for face recognition or ALPR (Automatic License Plate Recognition), fingerprint or retina scanners, or any other innovative access control technology.